Axzion is a manufacturer of load receptacles. It distributes and produces trusses, coil hooks and grippers and pliers. In the segment of the crossmembers, Axzion also offers the so-called H-cross beam, spreader cross beam, cross beam and different beam crossbars. Portal system for welding components up to 10 m in length and for weights up to 5,000 kg. It was important that the robot should work with both a single wire and a tandem torch. The package should also have the possibility of offline programming. 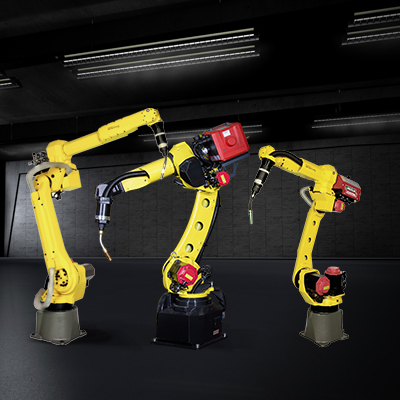 The ARC Mate robot pulls the weld seams of the gripping elements in an efficient manner, so that the saving effect is clearly within the double-digit percentage range compared to manual welding. The delivery times have been improved through the robot implementation. With the tandem torch, the robot can produce up to 11 kg per hour at wire feed speeds between 11 and 13 m / s. Very good welders are able to achieve 15kg per layer. The availability of such beams within a short lead time - just two and a half weeks according to Baumann - is also down to the use of robots in production. It was the system integrator that chose the FANUC ARC Mate 120iC/12L. A successor to this robot, the ARC Mate 100iD, was already on the market at the time of the selection, but only available in the basic and not the long-arm version. The “ARC Tool” software option used is the latest version. The robot hangs on a traverse with a ten metre traverse distance. The rack-mounted ARC Mate operates from above for a space-saving design. The melting rate with a single-wire torch is about 5 kg of wire per hour. With a tandem torch, the robot can run at up to 11 kg per hour with wire feed speeds between 11 and 13 m/s. Very good welders achieve 15 kg per shift. This is also an advantage of the robot. Secure and safe welded seams are required everywhere, also at Axzion in Neustrelitz, Switzerland, a manufacturer for the lifting of equipment. Loads of more than 1,000 tonnes are handled with their grippers and lifting beams.